Mycenae is an ancient city located on a small hill between two larger hills on the fertile Argolid Plain in Peloponnese, Greece. 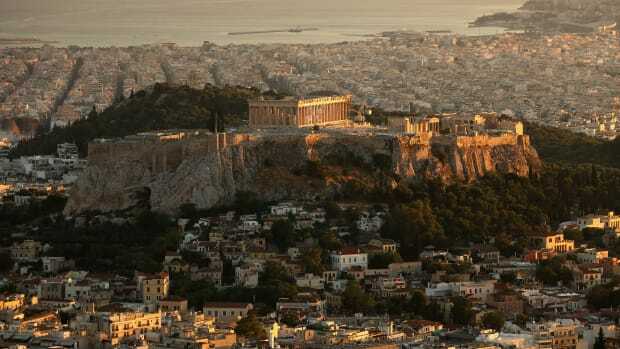 The Bronze-age acropolis, or citadel built on a hill, is one of the great cities of the Mycenaean civilization that played a vital role in classical Greek culture. Mycenae was also prominent in Greek mythology and inspired poets, writers, and artists throughout the centuries, though it was ultimately abandoned more than 2,000 years ago. Mycenae’s true origins are unknown. According to Greek mythology, Perseus—son of the Greek god Zeus and Danae, who was the daughter of Acricio, the king of Argos—founded Mycenae. When Perseus left Argos for Tiryns, he instructed Cyclopes (one-eyed giants) to build the walls of Mycenae with stones no human could lift. 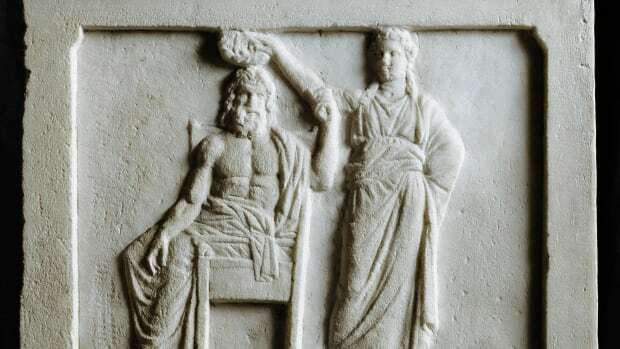 Perseus named the city Mycenae after the cap (myces) fell off his scabbard at the site, which he saw as a sign of good omen, or after finding a water spring to quench his thirst when he picked up a mushroom (myces) from the ground. The Perseid dynasty ruled Mycenae for at least three generations and ended with the rule of Eurytheus, whom legends claim commissioned Hercules to perform the 12 labors. When Eurytheus died in battle, Atreus became king of Mycenae. Mycenae is perhaps best known in mythology as the city of Agamemnon, the son of Atreus. King Agamemnon led the expedition against Troy during the Trojan War, which Homer accounted in his epic poem the Iliad. Mycenae is situated in a naturally fortified position between the sloping hills of Profitis Ilias and Mount Sara, located some 20 km southwest of the Mycenaean city Tiryns. 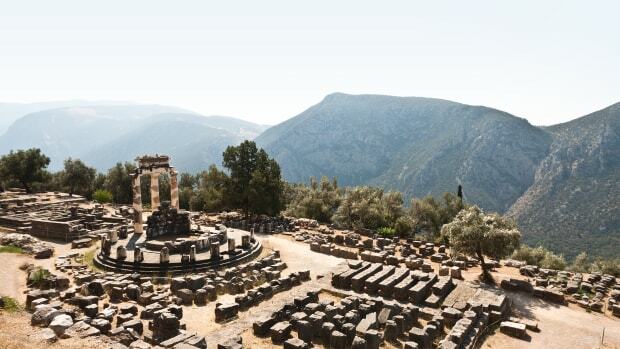 Mycenae and Tiryns were together recognized as UNESCO World Heritage sites in 1999. The central feature of Mycenae—as with other Mycenaean citadels, including Tiryns and Pylos—is a great central hall called the megaron, which consisted of a columned porch, vestibule, and main chamber. The megaron’s main chamber was a long rectangular room with a hearth in the center that’s surrounded by four columns supporting the roof. 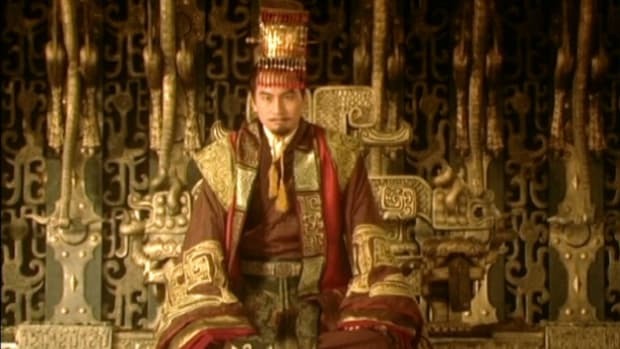 To the right of the hearth was a raised platform for the royal throne. The megaron was surrounded by an irregular complex of buildings that included offices, archives, shrines, corridors, armories, storerooms, workshops, potteries, and oil-press rooms. The massive “Cyclopean” walls of Mycenae also enclosed residential houses for aristocrats, various shrines, and Grave Circle A (so named by archaeologists), a stone funerary enclosure that contained massive shaft graves for the Mycenaean elite. The citadel’s primary entrance was the Lion Gate, named for the lion sculpture that sits above it. Outside the walls of Mycenae was the residential area of the city, Grave Circle B (which predates Grave Circle A), and various dome-shaped tholos (beehive) tombs, including the famous Treasury of Artreus (or Tomb of Agamemnon). Archaeological studies suggest the area of Mycenae was first occupied in the Neolithic Age dating back to about the 7th millennium B.C. But these early settlements left few records due to the site having continuous re-occupation up until the founding of the citadel. The first families of rulers and aristocrats likely arose in the Mycenae area around 1700 B.C. during the early Bronze Age, as evidenced by the construction of Grave Circle B. In 1600 B.C., inhabitants constructed Grave Circle A, the first tholos tombs, and a large central building. 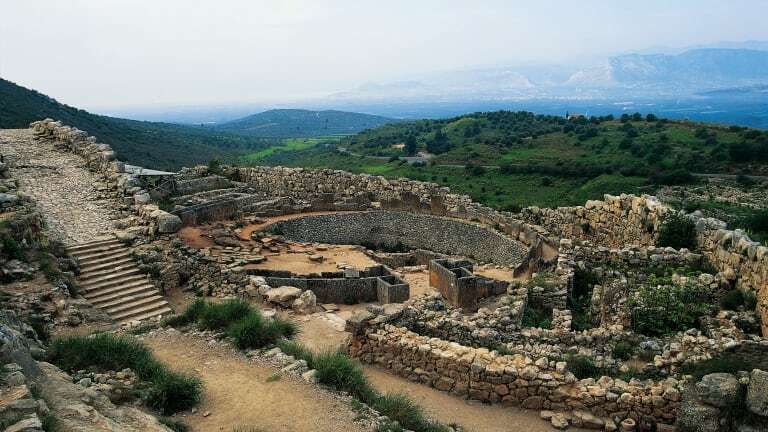 The majority of the Mycenae monuments visible today were constructed in the late Bronze Age between 1350 and 1200 B.C., during the peak of the Mycenaean civilization. 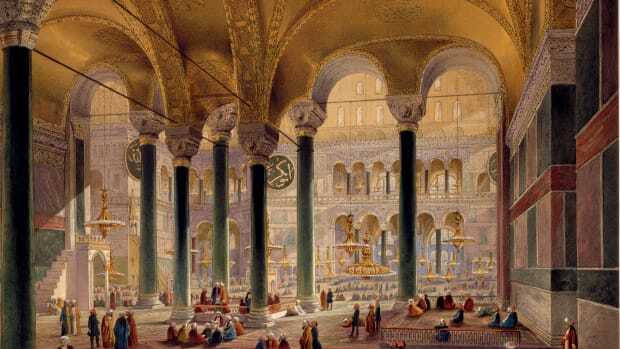 The construction of the palace and city walls began around 1350 B.C. About 100 years later, Mycenaeans constructed the Lion Gate and its bastion, along with a new wall to the west and south of the original wall. This new fortification encompassed Grave Circle A and the city’s religious center. 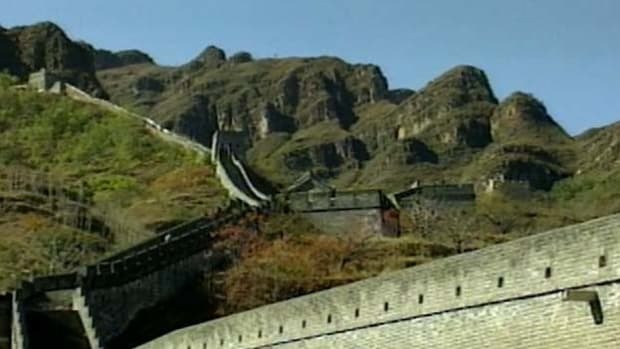 On the heels of a destructive earthquake, the walls were extended to the northeast around 1200 B.C. Mycenaeans enjoyed a prosperous rule over the Greek mainland and areas around the Aegean Sea, with the elite living in comfort and style, and the king ruling over a highly organized feudal system. In Mycenae and other Mycenaean strongholds, workshops produced an array of both utilitarian and luxury goods, including weapons and tools, jewelry, carved gems, glass ornaments and vases, which likely transported oil, wine, and other commodities for trade. What’s more, funerary artifacts unearthed at the Grave Circles were made of precious metals (gold, silver, and bronze) accentuated with precious stones and crystals. Mycenaeans also likely engaged in mercenary wars and piracy, and they were known to periodically raid and loot the coastal towns of Egyptians and Hittites. Mycenae and the Mycenaean civilization began to decline around 1200 B.C. Mycenae’s people abandoned the citadel around 100 years later after a series of fires. 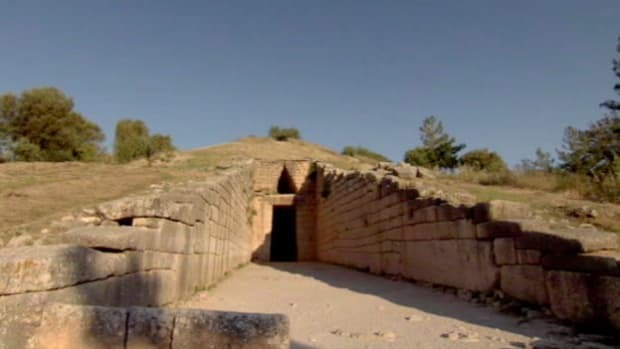 It’s unclear what caused the destruction of Mycenae, though theories abound. One of the leading theories holds that Mycenae underwent years of civil strife and social upheaval. Dorians and Heraclids then invaded, sacking all of the Mycenaean strongholds except Athens. Mycenae may have further suffered at the hands of raiders from the sea. Alternatively, Mycenae may have fallen to natural disasters, such as earthquakes, volcanic eruptions, drought or famine. 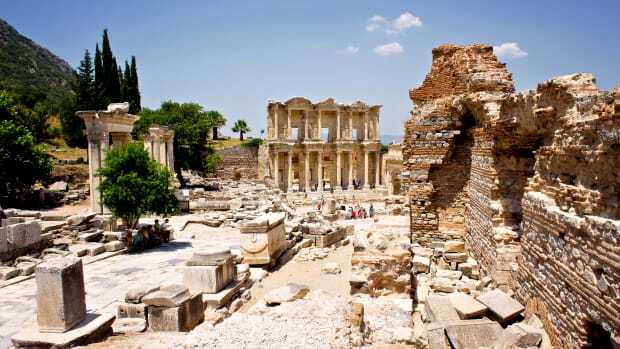 Whatever the case, though the citadel was abandoned, the outer city was not completely deserted and the remaining town was sparsely inhabited until the Greek Classical Period (5th and 4th centuries B.C.). During the Greek Archaic period (8th to 5th centuries B.C. ), a temple dedicated to Hera or Athena was erected on the summit of the Mycenaean citadel. Mycenae later took part in the Persian Wars, sending 80 men to the Battle of Thermopylae. Mycenae’s neighboring city Argos, which had remained neutral in the war, retaliated by conquering the town and destroying parts of its walls. Sometime during the Hellenistic period—the period between Alexander the Great‘s death (323 B.C.) to the emergence of the Roman empire (31 B.C. )—the people of Argos founded a village on the Mycenae hill, repaired some of the citadel’s walls and Archaic-period temple, and built a small theatre over the walkway to the tholos Tomb of Clytemnestra (Agamemnon’s wife). At some point, however, the new village was subsequently abandoned. When the Greek geographer Pausanians visited the area in the 2nd century A.D., Mycenae had already been in ruins. In 1837, the Mycenae archaeological site came under the jurisdiction of the Greek Archaeological Society. Its representative, Greek archaeologist Kyriakos Pittakis, cleared the Lion Gate in 1841. Heinrich Schliemann, a pioneer in archaeology, conducted the first excavations of Mycenae in 1874, uncovering five graves in Grave Circle A. 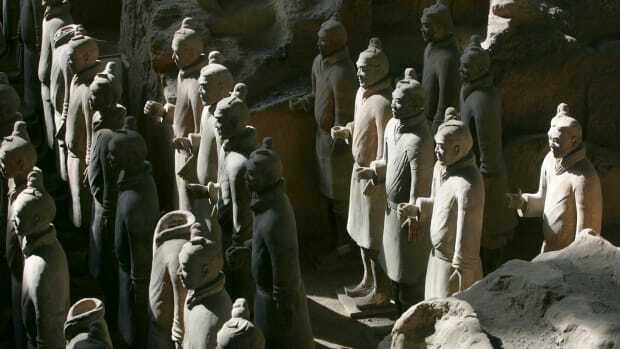 Various archaeologists in the late 1800s and early to mid 1900s continued his work excavating the palace and cemeteries. 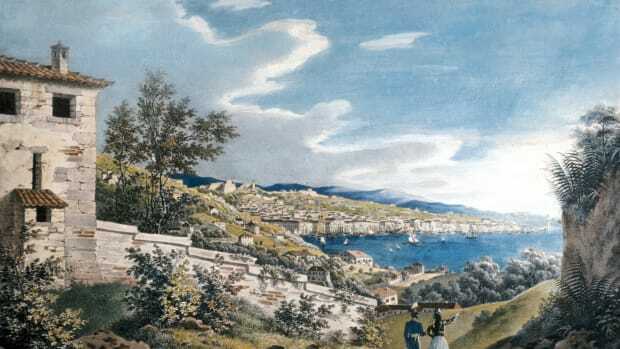 In the 1950s, George Mylonas of the Greek Archaeological Society led excavations of Grave Circle B and parts of the settlement outside of the Cyclopean Walls. Around the same time, members of the society restored the Tomb of Clytemnestra, the megaron, Grave Circle B, and the area surrounding the Lion Gate. Further restorations continued in the late 1990s. Excavations of Mycenae, particularly of the lower town outside of the citadel walls, continued in the 2000s. 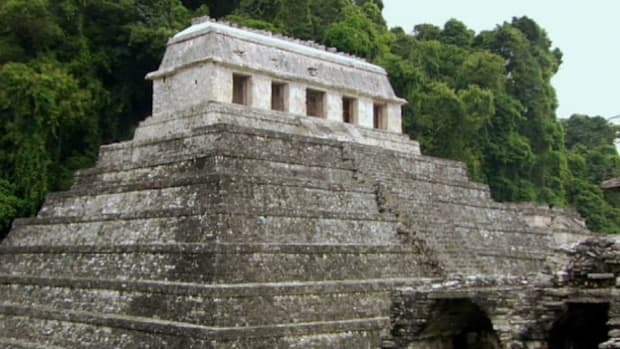 Surveys suggest the area holds hundreds of visible and buried structures, including tombs, houses and other buildings, guard towers and beacons, roads and highways, bridges and dams, and an outer fortification wall with three gates. Mycenae; Ministry of Culture and Sports. Archaeological Sites of Mycenae and Tiryns; UNESCO. Mycenae and Tiryns; Greek National Tourism Organisation. 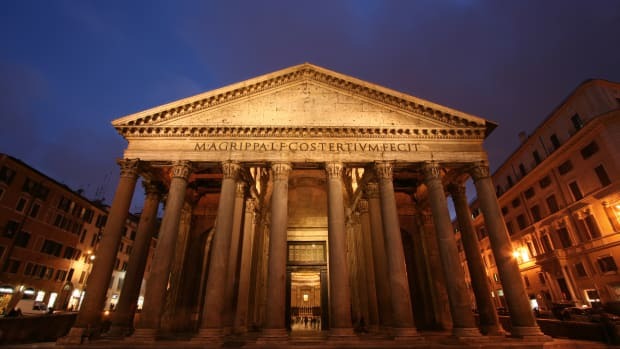 ABCs of Greek Architecture; The New York Times. Beyond the Walls of Agamemnon: Excavation of the Mycenae Lower Town (2007-2011); Dickinson Excavation Project & Archaeological Survey of Mycenae. Thomas R. Martin. An Overview of Classical Greek History from Mycenae to Alexander. Perseus Digital Library.